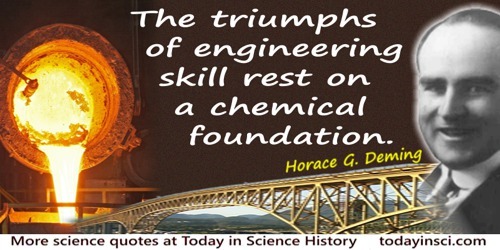 Engineering, too, owes its most useful materials to the achievements of chemists in identifying, separating, and transforming materials: structural steel for the framework of bridges and buildings, portland cement for roadways and aqueducts, pure copper for the electrical industries, aluminum alloys for automobiles and airplanes, porcelain for spark plugs and electrical insulators. The triumphs of engineering skill rest on a chemical foundation. In Fundamental Chemistry, and Elementary Textbook for College Classes (1936), 8. Vitrivius Pollio, De Architectura, ix, prologue, section 10. The progress of synthesis, or the building up of natural materials from their constituent elements, proceeds apace. Even some of the simpler albuminoids, a class of substances of great importance in the life process, have recently been artificially prepared. ... Innumerable entirely new compounds have been produced in the last century. The artificial dye-stuffs, prepared from materials occurring in coal-tar, make the natural colours blush. Saccharin, which is hundreds of times sweeter than sugar, is a purely artificial substance. New explosives, drugs, alloys, photographic substances, essences, scents, solvents, and detergents are being poured out in a continuous stream. In Matter and Energy (1912), 45-46. This famous anecdote, being written about two centuries after Archimedes, is of questionable authenticity, but Vitruvius provided the origin of the story as we know it. In De Architectura, Book 9, Introduction, Sec. 10. As translated in Morris Hicky Morgan (trans. ), Vitruvius: The Ten Books on Architecture (1914), 254. Also seen translated as “While Archimedes was turning the problem over, he chanced to come to the place of bathing, and there, as he was sitting down in the tub, he noticed that the amount of water which flowed over the tub was equal to the amount by which his body was immersed. This showed him a means of solving the problem. … In his joy, he leapt out of the tub and, rushing naked towards his home, he cried out with a loud voice that he had found what he sought.” In Ivor Bulmer-Thomas, Selections Illustrating the History of Greek Mathematics (1939), 37.